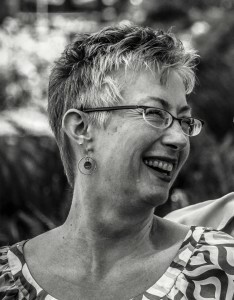 According to Susanne Skubik Intriligator, UUA’s Online Strategist, when enough people indicate an interest in a topic, Facebook generates an “interest” page for that topic and populates it with Wikipedia content. 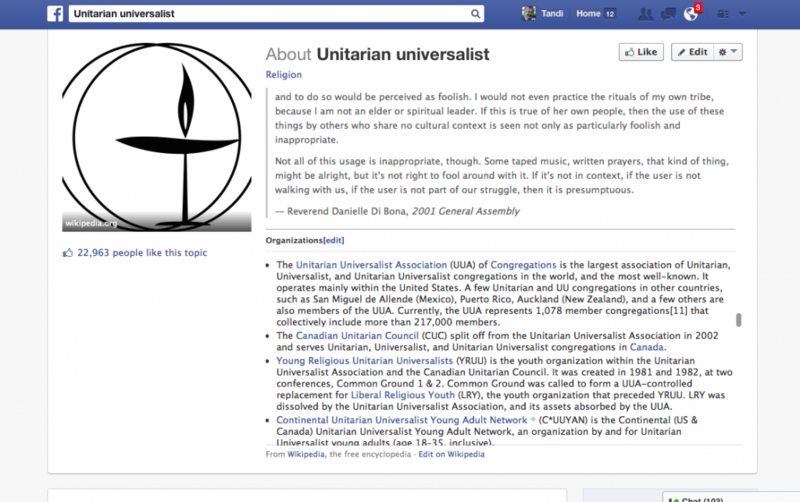 Right now, there’s a Facebook interest page called “Unitarian Universalism” that describes our religion. It’s unowned, and is liked by 23,000 people. (Linked with similar “Unitarian Universalist” page). You can help that page be a real page, linked to a real UU religious organization. Go to the About Unitarian Universalism Facebook page. “Like” the page, if you are inclined. Why does this matter to the growth? It’s important because it gives people a link, from an unaffiliated Wikipedia-filled FB page to the actual UUA feed. It’s not instructive. It’s not about institutional control. It gives the general public more direct information about how to learn more about our movement. And guess what? You can add to it! Are you ready and willing to give it a try? Rev. Tandi Rogers wants people who are seeking communities of progressive, covenantal faith to call home or to call partner to find us. Most any means necessary. The more creative and collaborative, the better. Hi Tandy, can this be done on the mobile (smartphone) version of Facebook or do you need to be logged in at a computer. I’m on mobile right now and don’t see the “edit” option. Thanks! This is a computer job at the moment. It looks like that FB platform doesn’t fully work on phones. Thank you so much for your effort! Thanks for organizing this effort!